The blue colour is for the sky that I hope to be shimmering over us this weekend (fingers crossed as ever in this part of the world!) What with Cousin Martie from New Zealand staying, and oldest son, Nicola (his partner) and their three children venturing over to Hornsea, we need some sunshine this weekend. So, to go with all this sunshine and blue sky that we are anticipating, I’ve been putting together some Weekend Fun Summer recipes for us all to eat. As always, with children ranging from almost 4 years old to almost 14 years old, adults and Cousin Martie from N.Z, there will be a range of tastes. Recipe for Yakitori Sauce Mix 1 tbsp cornflour with 1 tbsp Sake to a paste. Put 2 more tbsp Sake, 125 ml light Soy Sauce, 4 tbsp Mirin and 2 tsp Golden Caster Sugar in a small saucepan, whisk in the cornflour and heat until the sugar has melted and sauce thickened, then cool before serving. Put the corn cobs in a microwaveable dish with about 1 cm water. Cover with cling film, poke a couple of holes through and microwave for 10 mins on High (based on 750 watt microwave) until tender. When cool enough to handle, trim the rounded ends and cut the rest into 3 - 5 cm chunks. Mix 1 tsb Yakitori Sauce with the oil and brush all over the corn. Heat a griddle pan or barbecue and sear the corn on all sides until starting to char. Lift into a a bowl, add the remaining sauce and toss to coat. 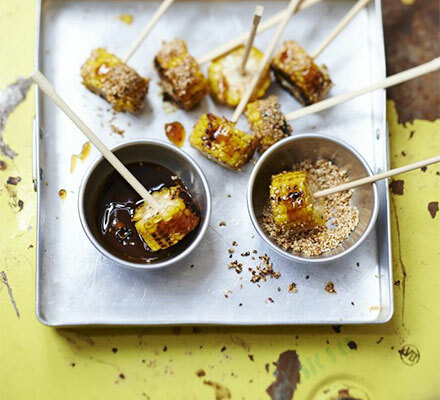 Add a stick to each - like a lollipop - and dip each corn pop into the sesame seeds to coat before eating. I love adding fresh herbs to such a dish as this - the Bay Leaves can be straight off your Bay Tree if you want - and I use fresh Thyme or Oregano from my garden, and sometime spicy Black Pepper. Place the potatoes in a large pan, cover with water and bring to the boil. Simmer for 5 - 8 mins until starting to soften but not falling apart. Drain and leave to steam-dry in the colander for a few mins. Heat the oil and butter in a large frying pan. Scrunch up the bay leaves in your hands and add to the pan along with the garlic cloves. Once the potatoes are dry, tip into the pan and season. Toss them in the pan and cook over a medium-high heat for 20-25 mins, turning gently often, using a fish slice so that you don't break them up. 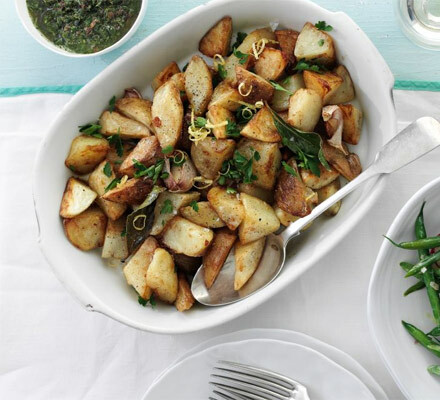 When the potatoes are crisp and golden, grate the lemon zest straight over and cook for 1 - 2 mins more. Taste for seasoning (I love to scatter a handful of Maldon salt over), scatter with parsley and serve. Next, because Erik and myself are trying to lose a few pounds (well,a lot, really) here is a healthy and very tasty Thai Carrot Slaw. 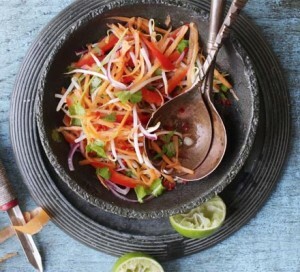 Combine carrots, red pepper and red onion in a bowl with the beansprouts. Mix the chilli with fish sauce, lime juice and sugar. Pour dressing over the slaw and stir through coriander just before serving. 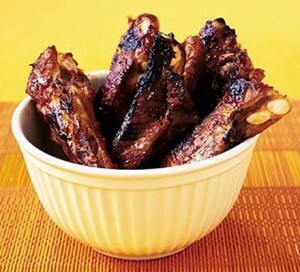 Weekend Fun Summer Recipes should include a homemade Barbecue Sauce recipe. The reason I am adding this to the recipes is that it is surprisingly similar to the one I always use, and everybody loves it. Hope you do too. This sauce is great for marinading your sausages and ribs, then pre-cooking them slowly. Finish off the sausages and ribs on the barbecue. Drain off liquid into a pan, heat up and use it with the meal. Heat oil in a saucepan and add the onion. Cook over a gentle heat for 4 - 5 mins, until softened. Add remaining ingredients, season and mix. Bring to the boil then reduce heat and simmer for 20-25 mins, until thickened. For a smooth sauce simply whizz the mixture in a food processor or with a hand blender for a few seconds. Last, but not least, I am adding this fabulous dessert recipe that I will be making this weekend, for both adults and adventurous children. My own strawberries are not quite ready so I will be scouring the shops for some luscious, juicy berries. This sounds absolutely delicious, especially after a spicy barbecued meal. Vanilla or Coconut Ice Cream to serve. Using a vegetable peeler (or a Canelle knife) pare the zest from lime in long strips. Shave away any white pith from the back of the zest (this can make it bitter), then put the zest in a medium pan. Squeeze both of the limes and add the juice to the pan with 3 tbsp water, the sugar and the crushed and whole peppercorns. Heat gently until the sugar dissolves, boil, then take off the heat. 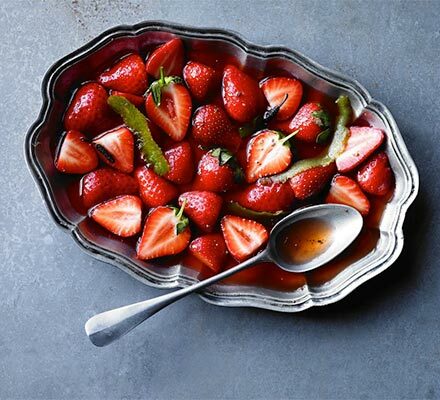 Spread out the strawberries in a serving dish then pour over the hot syrup and allow to cool. As this happens, the syrup will become rosy pink. Serve at room temperature with scoops of ice-cream. Well, that’s all the Recipes for Weekend Fun for now. I’m always on the prowl for more recipes, whether it’s ancient or new cookbooks, magazines, friends, blogs or newspapers. But it is great to be able to share them all, and amazing to be able to do it with people all over the world. Keep watching out for more and I really hope you do enjoy them.